Your smile speaks volumes about you and can really influence your daily life. If you’re not proud of your smile, both your professional and personal relationships can suffer. 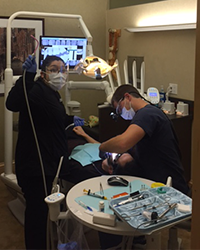 Restorative dentistry services by a great dental practice like La Costa Dental Excellence can quickly change how you look and feel, and give you an incredible new smile you can’t wait to show off. What Restorative Dentistry Services Are Available at La Costa Dental Excellence? Tooth Colored Fillings – Tooth colored fillings, also known as white fillings, are fillings that restore tooth functionality and mimic the natural appearance of teeth. In addition to repairing teeth that have experienced fractures or decay, tooth colored fillings may also be used aesthetically to change the size, color and shape of teeth. Dentures – Missing or damaged teeth could have a very negative impact on your daily routine and how you are seen by others. Dentures can be a great solution to improve your oral health and will also give you a beautiful, natural looking smile. Dental Crowns – A dental crown, sometimes called a cap for teeth, is gently placed over a tooth to restore your smile and strengthen the existing structure. Often used in conjunction with a dental implant, which acts just like your natural tooth root, dental crowns can fill in the gaps you may have and also improve your overall oral health. Dental Bridges – A dental bridge acts as its name suggests; it helps to fill any gaps in the mouth caused by one or more missing teeth. Dental bridges can act as a bridge between both natural teeth or other restorations such as dental implants. Why Choose Restorative Dentistry Services? Build Your Confidence | Are you tired of being embarrassed of your smile? With today’s advances in restorative dentistry you can drastically change how your smile affects both how you behave around others and how you feel about yourself. Your Oral Health Is Important | Restorative dentistry services like placing a dental crown or a dental bridge can resolve any current issues you are facing and also prevent many future serious issues. Fast and Efficient | In just a short amount of time your smile can go from drab to absolutely fabulous. We offer many restorative dentistry services that give your smile the boost it needs in very little time. Services range from dental bridge and dental crown procedures, to dental implants and dentures. We’ll partner with you to determine the best plan for your smile. A Gorgeous Smile | We focus on restoring your smile to a strong and functional state so you can smile, laugh and eat like you wish you could. Our top-quality restorative dentistry procedures also improves the aesthetics of your smile, giving you the confidence to grin whenever you wish. Contact us today to find out about the restorative dentistry services we offer to the wonderful people of Carlsbad, Encinitas, San Marcos and the surrounding San Diego area and to schedule a consultation with Dr. Dankworth!